Since I have two daughters that love to create things, I really loved this story about creativity and persistence. And I especially liked the doggy assistant! For the early grades' exploration of character education, this funny book offers a perfect example of the rewards of perseverance and creativity. The girl's frustration and anger are vividly depicted in the detailed art, and the story offers good options for dealing honestly with these feelings, while at the same time reassuring children that it's okay to make mistakes. The clever use of verbs in groups of threes is both fun and functional, offering opportunities for wonderful vocabulary enrichment. The girl doesn't just "make" her magnificent thing -- she "tinkers and hammers and measures," she "smoothes and wrenches and fiddles," she "twists and tweaks and fastens." These precise action words are likely to fire up the imaginations of youngsters eager to create their own inventions and is a great tie-in to learning about Science, Technology, Engineering and Math. 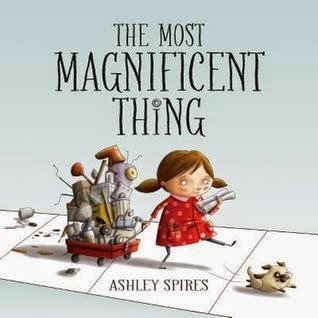 The Most Magnificent Thing, written and illustrated by Ashley Spires was published by Kids Can Press in 2014. The illustrations in this story go so well with the text. I love the expressions on the girl’s and the dog’s faces as they work on their project. 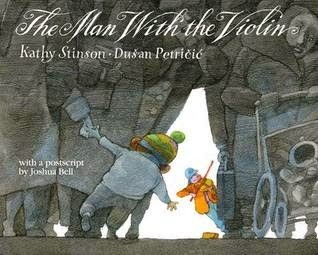 There are lots of details that children can explore when looking at this book on their own. As a teacher, there are so many ways to use this book! Young children will relate to the emotional side of the story, where the girl gets frustrated because her ideas don’t match up to her vision. I would love to use this to spark some discussion with students about ways to manage angry feelings – and draw their attention to the strategy of just walking away for a little while. 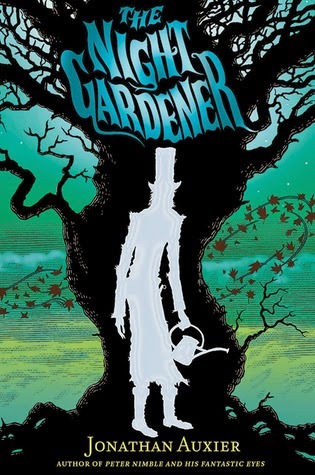 The illustrations and style of art in this story would also be great for modeling an art style students could try to create their own work, using the technique of adding colour for emphasis or for the important parts of the story (perhaps comparing and contrasting with other books that use a similar style, such as Steve Light’s Have You Seen My Dragon?). The Ontario Library Association has announced the winners for this year's Forest of Reading Awards. In the middle grade category (Silver Birch), the winner is THE NIGHT GARDENER by Jonathan Auxier. 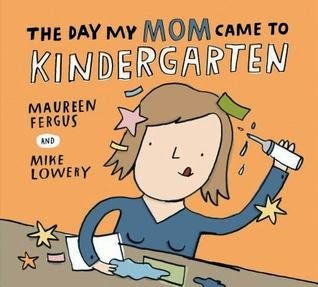 In the picture book category (Blue Spruce), the winner was THE DAY MY MOM CAME TO KINDERGARTEN by Maureen Fergus and Mike Lowery. What a fun story! I read (or have heard read aloud) most of the picture book nominees, and I'm so glad I didn't have to pick a winner, because they were all amazing! It's May? How did that happen? 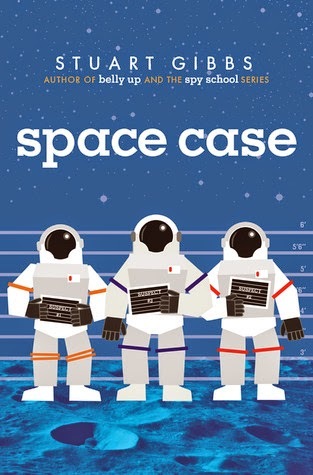 I haven't read many middle grade books lately, so I don't have a new one to share with you today. Suggestions for books to read are always welcome! I'm especially interested in trying some funny MG books with magical elements, since that's what two girls at my school said they love to read. But since the story that I've been working on is a dog story, I'm going to "re-run" a favourite dog story that I reviewed before. 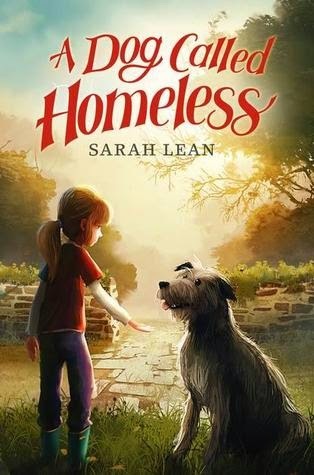 I really enjoyed this story, partly because I love stories with dogs in them. But this was much more than just a dog story. This story is about a girl learning to cope with the loss of her mother, trying to hold her family together, and finding her own voice. I loved the friendships Cally made with Jed, a homeless man, and Sam, a boy who is deaf and blind. I will definitely look for more books by this author! I read this one as an e-book from my local library. I loved the way the author painted images with her words that connected to the feelings she created in the story. This was another story where every word counts. Sarah Lean lives in Dorset in England with her family and dogs. She started writing when she was around ten years old, but she became a teacher before she started her writing career. For more info, visit Sarah Lean’s website.